Personal finance blogs are awash in articles about how to make money, often a lot of it. That’s something we all need to work on, after all – you only cut your living expenses so much and then you need start earning more money. But I’d like to take a look at cutting living expenses as part of a comprehensive strategy. It’s not an exaggeration to say that you can find financial freedom by living on the cheap. Income is half the equation in financial success. Controlling spending is the other half. This is critical because the difference between the two is what you have available for saving money, paying off debt, and building long-term investments. That means that both increasing income and cutting spending are important in any effort where financial success is the goal. Rather than looking at controlling spending in terms of clipping coupons and finding bargains, let’s take a more radical approach. Let’s consider the implications of adopting a full-blown low-cost lifestyle. Exactly what that will look like look depends on your own financial situation. If you have an upper-middle-class income, it may look like living the middle-middle class lifestyle. At the extreme, if you have a lower middle-class income, it might mean living as if you’re poor. Probably as a result of overdosing on too much TV, many of us live with the delusion that we can live in suburban comfort – complete with all the expected toys – and still achieve financial freedom. More specifically, we might even think that we can do this in just a few years. Reality check: it’s not gonna happen. The only way that you will achieve financial freedom quickly – or even attain it at all – is by maximizing the difference between your income in your living expenses. And if you’re the average person, you probably won’t be able to do that without experiencing a strong measure of discomfort. Part of the problem we have today is that we live lives of acquisition. We perceive that we need a comfortable home in a prosperous suburban community with top-rated schools, that we need to drive an above average late-model car, and that we need to visit all those tropical hotspots that we see on TV for our next vacation. But here’s a cold, hard dose of reality: financial freedom and acquisition aren’t compatible. If you are going to achieve true financial freedom, you’re going to have to spend less of your income on what should properly be described as the “desserts” of life, and dedicate far more to savings and investments. Saving 10% of your income each year probably won’t cut it. At a time of rising costs that will most likely do little more than keep you one step ahead of your bill collectors. If you’re really committed to achieving financial freedom, then you need to set your savings target higher. 20%, 30% or even 50% or more of your income, each year. That probably won’t leave you with a comfortable lifestyle – at least not compared to your income. But in all likelihood, you’ll only need to live that way for a few years, until your investment nest egg is big enough. By then, you’ll be able to afford a few more toys. There’s another complication with a high consumption lifestyle, one that’s almost subliminal. As you sweeten the trappings of your life, your expectations rise along the way. A single family home in a prosperous suburban neighborhood requires better furniture, a better car, and even more expensive hobbies. As you acquire each of these, you’re setting in motion a sequence of expenses. For example, when you buy a house or car, you probably won’t pay for either with cash. You’re taking loans that mean monthly debt service. You’re probably also increasing your insurance premiums, utility bills, and even your repair and maintenance expenses. Typically, the more that you pay for anything that you acquire, the more it will cost to keep it up and running. That will have a negative impact on your budget. If you avoid acquiring all the good stuff – or at least buy them on the cheap – you’re helping to keep your living expenses low. And because you have less, you also need less. If you buy a brand-new car, you may be paying $7,000 per year in monthly car payments and higher insurance premiums. If instead you keep your 10-year-old car, you will pay maybe $2,000 per year in repair and maintenance costs. It won’t be as pretty, but you’ll have an extra $5,000 per year for better purposes. Let’s say you earn $50,000 per year, out of which you pay $10,000 in income taxes and other payroll deductions, and $35,000 for living expenses. That leaves you with $5,000 for savings and investments. Now let’s say that you eliminate one or two big expenses in your budget, or five or six smaller ones. In doing so, you lower your living expenses to $30,000 per year. You now have $10,000 for savings and investments.. Just by lowering your cost of living, you double the amount of money that you have available for savings and investments. 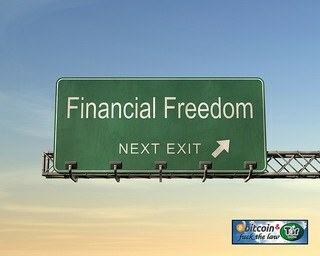 Your chances of obtaining financial freedom also double. This works even better at higher income levels. If you earn $100,000, with $30,000 going to income taxes another payroll deductions, you have $70,000 left over. If you can live on $35,000, you’ll be able to save $35,000 per year. How long would it take you to achieve financial freedom if you could pull this off? I realize that this approach is countercultural. Most people do the opposite – as their income increases, so do their living expenses. This is properly referred to as lifestyle inflation. That’s a lifestyle in which any additional income is consumed by the drive to create a more comfortable – and more impressive – life. It’s the life we see on TV. The better way is to devote higher income to savings and investments. Think in terms of devoting your money primarily to the acquisition of assets that will provide even more income. Financial freedom reaches perfection when the cash flow from your investment assets provide you with enough income to live on. For most of us, that will be worth more than all the toys in the world. But you’ll have to do without a few toys to get there. Retirement planning has reached mania status in America. It’s the pot of gold at the end of the rainbow, and everyone wants the biggest pot possible. The problem is that people’s lifestyles don’t always support their stated goals. It comes down to thinking that you can have it all. You can’t. In order to get there, you have to give up a few things along the way. Most people won’t. So far we’ve talked about how living on the cheap creates more money for savings and investments. That has obvious implications for retirement. But there’s more to that arrangement than meets the eye. By living on the cheap – the same strategy that allows you to save and invest more money – you also get into the habit of living on less money. That also has obvious implications for retirement. Lower living expenses mean less income will be needed in retirement. You won’t need to save as much, because you won’t need as much. This allows you to attack retirement on two fronts – to build up investments to create income, but also to lower the amount of income that you will need. By working in both directions at the same time you increase the chances of reaching early retirement exponentially. You won’t just be dreaming about it – you’ll be doing something about it. If you think that living on the cheap isn’t possible, please check out this post, Imagine Being Owned By No One. Not only is it possible, but some people are already doing it. You can too – and reap all the rewards that come with it. I totally dif this concept…radically changing our spending patterns and habits…sure beats just cutting cable, lattes and some other things. The fact that it takes a wholistic approach implies that we are more likely to adopt it without getting fatigued by all the cutting down, it simply becomes our way of life. If were to sum it up: Less stuff = A happier and fulfilled life with hope for financial independence, now who wouldn’t want that? Hi Simon – Me too! I’d rather keep my house payment low, and drive an inexpensive car, than to have to give up the smaller plearures in life, like dinner out with my family or coffee with my friends. The really good point is that by keeping your major expenses low, you also keep related expenses down too. People lose sight of that. You can’t move into a big house and keep your expenses low. I agree with lowering living expenses the more money you make. I look at it as the more I make, the more I can escape fixed debt payments and other fixed monthly payments by investing smart. Great points! Hi Blair – Give yourself a pat on the back for getting it! I really don’t think most people do. As income rises, so does consumption. It seems almost radical to save more as you make more, though it should be a “no brainer”. Kevin – great article! I’m a big proponent of multiple streams of income, which is similar to what you described. At the end of the day, like you described in your article, it’s about balance. A balance between high income and low expenses. Hi Charlie – I see so many people work so hard to make more money, only to watch them mis-invest it in a more luxurious lifestlye. There’s a bit of a corruption there – as income rises, so does the feeling of invincibility. Where they could be in a position to kick back and relax after ten years of high income, instead they make it disappear into lifestyle inflation. Worse, if the income collapses, they have to start all over – often with a pile of debt. I think most people lose track of what the true cost of ‘living’ is. Since writing my blog, I have been tracking every nickel I spend on a spreadsheet, and found this to be such a necessary tool when it comes to saving. I analyze my spending every month and make a game out of spending less the following month and let me tell you..It is so gratifying! Hi Jim – That’s so true. Every living expense is seen as necessary and not ever questioned. Tracking becomes completely necessary to give you a handle on exactly where your money is going – and a lot of people are surprised to find out what they do. For anyone reading this thread, Jim has an excellent web site that will help you to find your way through your personal money issues. Check out Critical Financial to see what I mean. Thanks for the mention Kevin, much appreciated! Thanks (about the blog!). You’ll find financial freedom early in life, if you haven’t already. The fact that you can live on half your paycheck is libertating in itself, but saving the other half is virtually life-transforming!